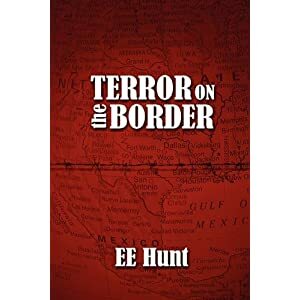 TERROR ON THE BORDER (Unrivaled Books) by E.E. Hunt will have you on the edge of your seat from the first page to the last as Jack Cassidy, his young wife, Juanita Delgado and her cousin, U.S. Border Patrol Officer Orlando Delgado battle the ruthless Hernan Cortez, Mexico’s most brutal drug lord and his blood thirsty gang, Los Lobos. Modeled after the real gangs and drug cartels of nightly newscasts, Hunt has crafted a story as chilling as any true crime tale and brings to life the adrenaline stoked exploits of gun toting gangsters and merciless drug dealers.Skillfully weaving true-life events into a fictional narrative that illuminates the harrowing world of illegal narcotics and human trafficking, Hunt tells the story of a teenage Juanita Delgado, kidnapped on a rural road and smuggled across the U.S. border to work in the slave trade in a Dallas brothel. Freed from her cruel captors by Jack Cassidy, the two marry and join forces to help the poor citizens of San Miguel, Mexico; a town ravaged by the violence and lawlessness of the Los Lobos gang. But Hernan Cortez has other plans as he targets a rich uncle of the Delgado cousins and sets about abducting Juanita and Orlando to torture and hold for ransom. In a daring escape from Cortez and his strongmen, Juanita and Orlando reunite with Jack and warn their rich uncle of Cortez’s plan. As Jack, Juanita and Orlando race to the U.S. – Mexico border, a shocking plot twist seals the fate of Cortez and his sadistic enforcer, Manuela and Jack must finally pay the price of justice delayed. Hunt is a master storyteller who brings to life the numbing statistics of drug violence that we hear every day. In Mexico, the human slave trade is a $20 billion-a-year endeavor, second only to drug trafficking, with cartels bringing in over $64 billion a year from their sales to users in the U.S. The fictional Los Lobos mirror the exploits of the Zetas, a real drug cartel born of Mexican Army Special Forces deserters whose members include corrupt former federal, state and local police officers. Frightening in its accuracy and breathtaking in its brutality, Terror on the Border is a heart stopping read. This book kept me on the edge of my seat from the beginning to the end. I was amazed to find how I did not want to put it down as the action is non-stop and the situations that are brought up are ones in which you can only imagine (though I can see many of them happening). The book was well written both for plot and for characters. I was able to identify with the characters even though I had little in common with them. The story itself was full of twists and turns, but they are all ones which definitely kept my interest and attention and I was held to the end of the book wondering what would come next! This was a great book that all should check out!